Did you see the first couple of boys re-purposed Tshirt ideas here? That was Part I…..now, get ready for Part II. You know how quickly the little guys run out of clean clothes….. So I had to make a total of 4 new little Tshirt’s for my little buddy. And also because I just love something new and handmade on my little munchkins. I used some Tshirts that we already had (one had a pocket on it and I picked out the seam and took it off…) and then added a new look using knit scraps from my stash. For the argyle shirt, I cut triangles and then pinned them in place. Then I sewed around each one separately. Then I made the argyle criss-cross pattern with straight seams. I used a wider stitch (but not quite as large as a basting stitch) just so that bigger stitches were showing. And my little buddy’s big day will be in a few months, so I decided to make him a birthday shirt. You can just eyeball these shapes like I did (far from perfect…..but definitely charming) or you can cut your shapes from paper and then use that as a pattern piece to cut your knit. Then sew each shape on separately. Make sure to pin your pieces well and leave them in place as you’re sewing. Knit stretches and will shift if you’re not careful. I sewed two parallel seams around the outer oval, a zig-zag around the inner over, and then a single stitch around the ‘2’. Turned out fun. **Just a tip: You can use interfacing to help keep your knit in place while sewing. Or, you can pin and sew carefully and adjust your fabric and needle as needed, while sewing. I find that using a larger stitch while sewing with knits or using a zig-zag stitch really helps it from stretching so much. Also, try to stay away from the absolute edge…..as that gets a bit more difficult to sew. But have fun with it. Design your own, use these ideas, or start thinking of some ways to make your girls some new Tshirts. In most cases you won’t spend a thing….and it’s so fun to have something completely unique for your child to wear. 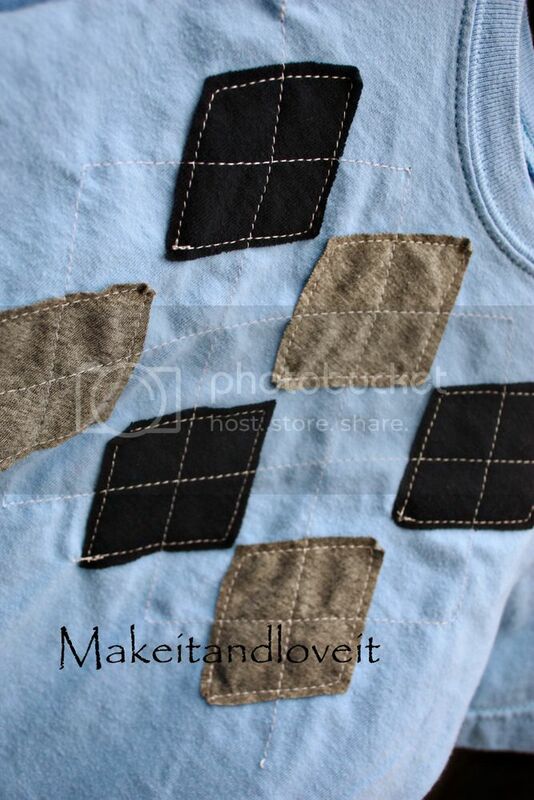 **Note: You can use cotton shapes instead, if you’re having a hard time working with knits on the Tshirt. I just love the look of keeping it all knit…..but appliqueing cotton on, would also be adorable. I would zig-zag around the edges though, to minimize fraying. Love them both. I recently got my hubby to go through his 4 million t-shirts…and now I have a couple ideas for the 100 he parted with! Thanks! oh I love these! What a great boy project. I love the argyle, that's genius! I think I may have to do this right now. The argyle is adorable! Do you think these would work with a basic cotton, since the t-shirt material is hard to work with? Yes Angie, cotton would work just fine also. I added a note about that….because I know some are leery of using knit. So Cute! The argyle is my favorite! cute! i make my boys a birthday shirt every year on their birthdays too. they love it! These are so cute! I am new to the world of sewing and would definitely like to give these a try! What fun shirts!! 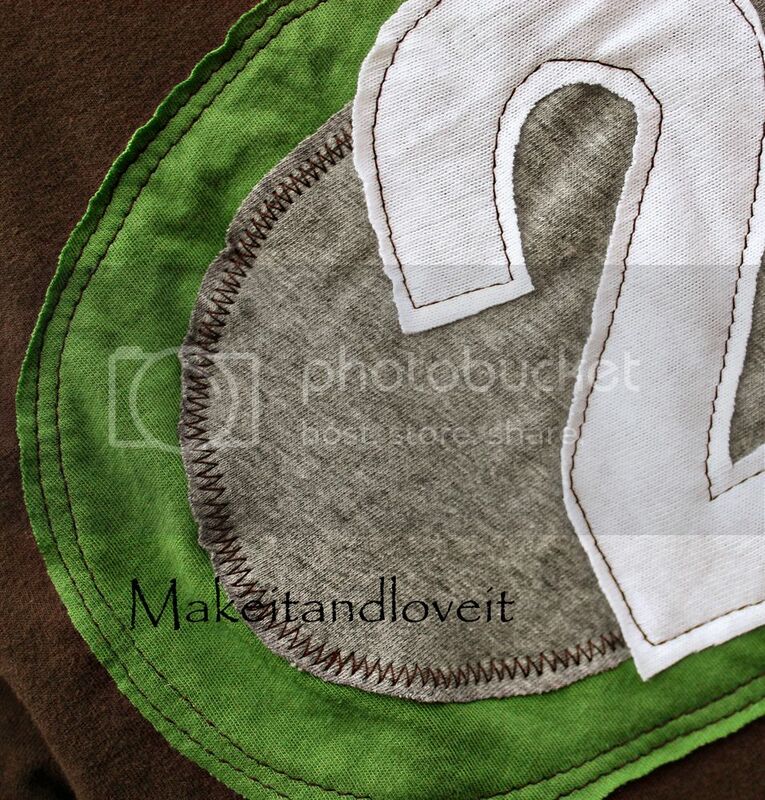 I have wanted to sew for our little boy but haven't had many cute, boyish ideas. I'll try these this week! What fun shirts!!! I have wanted to sew for our little boy but haven't had any cute, boyish ideas. I'll try these this week! Thanks! OMG! I want a me-sized argyle shirt!!!!! LOVE IT! Love the argyle too! And my little guys b-day is next week and I am definitely making him a birthday shirt! Thanks for the boys ideas, there isn't too much out there for them! so cute. I might just make one for myself too :) NOT with my age, though :) What foot do you use for sewing knits? I love these shirts. They are so fun and seem super easy to make. what a great way to cover up those "stains that are on forever" shirts. That is so creative and cute. I absoultely love it when I see projects that I know I can do. It makes me want to go sew right now. Thank you! I love these. You are so inspiring, lady! Thanks for this tutorial! I was just getting ready to make a t-shirt dress and thinking of adding an "applique." I was trying to decide whether to add a stabilizer under the qpplique which I cut out of another t-shirt. I don't know how it will wash. Have you tried this with and without a stabilizer? I have never sewn on knits before. I love, love, love the argyle! So cute! Love it! Thanks for some wonderful ideas! People like you make sewing so much fun. Those are adorable. I really need to get my sewing machine out! omg those are soooo CUTE!!!! Thanks so much. 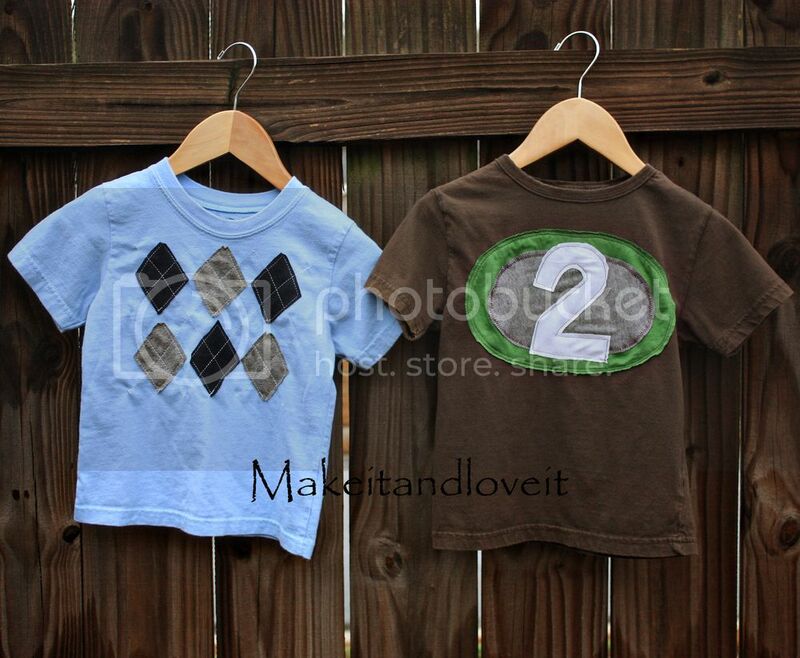 The argyle is to die for and my boy's birthday is in March…I might try the number shirt! I may even make the background a black mickey mouse head sillouete since we are having a Mickey party. Love them! Hmmm. I'm thinking of an argyle birthday shirt now! Knits scare me but I have done woven cotton appliques before. This is also a great idea for covering stained tees which little misters always seem to have! This would be a great way for me to make birthday shirts for my kiddos this summer. LOVE IT! Fantastic simple project. Love the argyle! I'm posting it on my blog about making gifts this holiday. I may make an argyle for myself! I actually made that argyle shirt (so cute, by the way) and it turned out great. I now have a new fav. shirt, thanks!